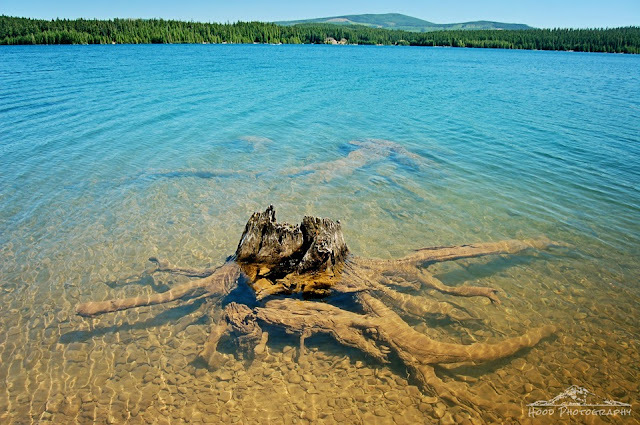 I took a great walk at Timothy Lake this past weekend with my new camera. We walked from the day use area at the west side of the lake to the tip of Meditation Point, about 2 miles each way. I had never done this walk before. What a nice little adventure, as it was stroller friendly as well. Nice blue colors! I love Timothy Lake. I've camped there many times and hiked around the lake many more. Actually the point you hiked to is called "Meditation Point." I often see Boy Scouts camping there. Enjoy your new camera! Oh, I LOVE the root coming out of the aquamarine! How beautiful! Love the colour and isn't it amazing how clear the water is. So pretty! sounds like a fun time with your son! I love this colour and the crystal clear water. Thanks for your post in ABC Wednesday.have a great week. Beautiful color and the stump coming out of the water is perfect. We were just at a lake called Stumpy Meadows. I love to go places where one can just walk and sit and enjoy the view. What a wonderful find! Beautiful clarity. Just wonderful! What a nice way to spent an afternoon. And great colours! Such magical water colours leading to a lovely view beyond! Lovely photo! That is a beautiful photo. Aquamarine is such a lovely color. What a lovely scene this is!